I wanted to share a recent Dan creation he whipped up the other week that was a huge crowd pleaser with our friends. 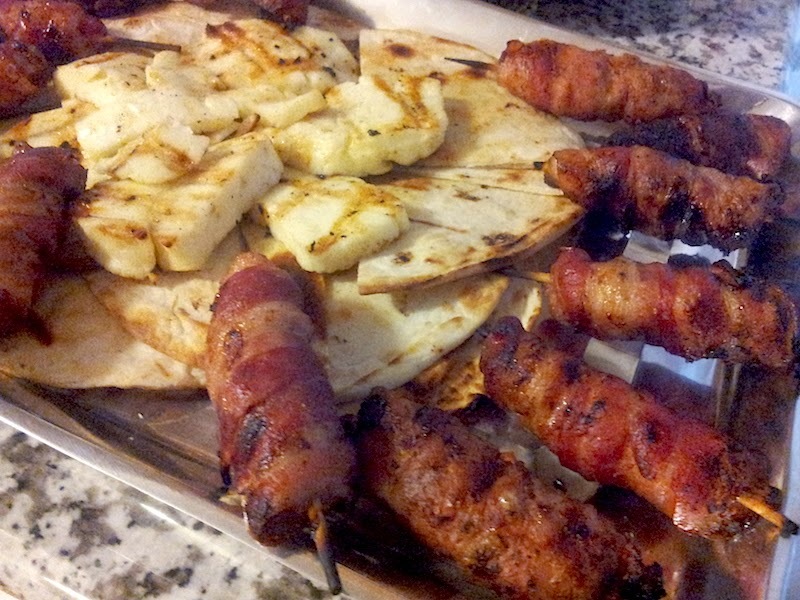 He nicknamed it his Bacon Bourekos, which are essentially oblong meatballs wrapped in bacon and then grilled on a BBQ. They're pretty simple to make and make for a nice party appetizer. Combine beef with all the other ingredients except for the olive oil. For the seasoning, you can just eyeball it, and Dan used about 1 tbs of Worcestershire sauce. Blend well until fully incorporated and then form into 1/2 inch wide and 3 inch long oblong spheres. Wrap in bacon and then put on a small wooden skewer that has been moistened with water. Put on a hot gas grill that's been oiled and cook for about 15 minutes or until the bacon is golden brown and the beef is cooked through. Serve with grilled pita bread and or grilled halloumi cheese.